Sheet: 24.5" x 32", Design: 21.5" x 28"
With tile stencils becoming more and more popular, we’re happy to offer this classical tile pattern that we call Myriam. This simple yet so beautiful Moroccan stencil pattern is perfect for walls, bath floors, hallways, and painted furniture projects. It can even be stenciled on a nursery wall. You can also stencil your outdoor patio cement floor, or right over your old tile floor or even over ugly linoleum! 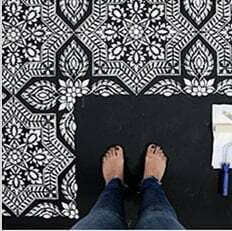 Learn How to stencil a tile floor – it’s easy even for beginners! Stencil features an easy registration system, just use parts of the previously painted design to align the stencil, check for level and continue. This gives you a seamless "wallpaper" look.